Chronic disorders, such as diabetes, heart disease, obesity, mental health problems and insomnia, are considered to be the leading causes of death and disability across the world. These are largely considered to be the consequence of unhealthy lifestyle choices and exposure to harmful disease stimulants. According to a 2018 report published by the Center for Managing Chronic Disease at the University of Michigan, more than 50% of the global population currently lives with some form of chronic disease. Projections indicate that the global prevalence of diabetes (considered to be one of the fastest-growing chronic disease indications), is around 451 million, and is expected to reach 693 million by 2025. In addition, the World Health Organization (WHO) estimates that, at present, 450 million people worldwide are suffering from some form of mental health problem and / or neurological disorder. The increasing prevalence of such clinical conditions has imposed a significant burden on the modern healthcare system. In the US, the cost burden related to such long-term clinical conditions has been estimated to be approximately 86% of the USD 3.2 trillion that is spent by the country on healthcare, each year. Digital healthcare, a relatively new concept that emerged only a few years ago, is believed to possess the potential to address the rising concerns related to the growing socio-economic burden. Driven by the demand for self-management approaches, personalized healthcare solutions and customized treatment regimens made available in the home-care setting, digital health companies are presently engaged in developing several innovative solutions for therapeutic, surveillance and diagnostic use. Various digital therapeutics, through behavioral and psychological interventions, have been designed to have a direct impact on the chronic clinical conditions by providing motivational support and encouraging patients to make better lifestyle choices. Such therapeutics are available in a variety of gaming solutions, standalone software applications or combinations of the aforementioned solutions with personal coaching support, artificial intelligence (AI) support and medical device(s). A number of digital therapeutics have already been marketed and a significant proportion of such candidate therapies are in R&D phase. In order to introduce such unconventional products into the market, companies have followed multiple approaches, which include both B2B and B2C variants. It is also worth highlighting that certain companies are even attempting to offer reimbursements for their proprietary products by conducting clinical trials in order to establish therapeutic credibility and convince insurance providers and payers. Significant advancements have also been made towards the development of novel solutions for remote monitoring and diagnosis of chronic disorders. Such solutions have been developed to provide healthcare assistance in real-time through smartphone applications and connected devices. These solutions vary significantly in complexity and range from simple solutions capable of tracking weight loss, blood pressure, body temperature and heart rate to more sophisticated solutions that are equipped to independently conduct blood tests to confirm the presence of a bacterial / viral infection. 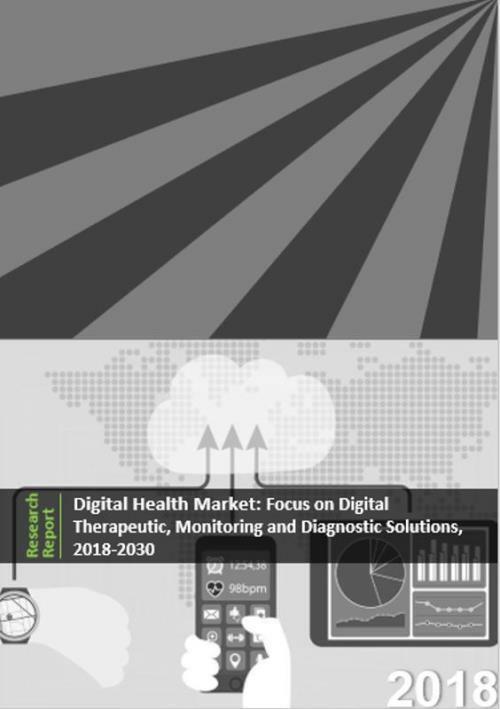 The ‘Digital Health Market: Focus on Digital Therapeutic, Monitoring & Diagnostic Solutions, 2018-2030’ report features an extensive study of the current landscape and future outlook of the growing market for digital therapeutics, monitoring and diagnostic solutions that are either commercialized or under development within the healthcare industry. This burgeoning field presently offers a lot of opportunities to innovation focused start-ups and investors. A discussion on the current market landscape of digital therapeutics, monitoring and diagnostic solutions, featuring information on the various developers of digital solutions, along with information on their type of solution offered, primary disease area, mechanism of action, purpose of solution, status of development (discovery, research / development, approved and marketed), launch year (if applicable) and business channels being used by stakeholders in this domain. Detailed profiles of some of the emerging players in the industry, highlighting their current focus area(s), information on digital solutions offered and clinical research results (wherever available). Each profile also includes a section on recent developments and a comprehensive future outlook, highlighting the achievements, partnerships / collaborations, and the likely strategies that may be adopted by these players for future growth. A comprehensive product competitiveness analysis of digital therapeutics for the most popular therapeutic areas taking into consideration the product portfolio (based on the total number of digital therapeutics being developed in that disease area) and key specifications of the solution, such as disease management support, user motivation features, tracking of health data and others. A case study highlighting the focus area and results of clinical trials that have been conducted for the evaluation of various digital therapeutics. An analysis of funding and investments made into companies involved in this segment of the overall healthcare industry; the analysis covers information on seed financing, venture capital financing, debt financing, other equity financing and grants / awards received by these companies. An analysis of the partnerships that have been forged between companies in this domain in the recent past, covering clinical trial collaborations, product development and commercialization agreements, pilot product offerings, product integration and other relevant agreements. A detailed case study highlighting the various business models and go-to-market strategies adopted by companies involved in this space. It provides details on various channels being adopted by stakeholders in the industry to increase awareness and offer access to their proprietary products. A SWOT analysis capturing the key parameters and trends that are likely to influence the future of digital therapeutics market. One of the key objectives of the report was to understand the primary growth drivers and estimate the future size of the market. Based on multiple parameters, such as prices of digital solutions, indication / region specific adoption trends, distribution channels and competitive landscape, we have provided an informed estimate on the likely evolution of digital therapeutics and digital monitoring / diagnostic solutions till 2030. We have segmented the market by therapeutic areas (such as metabolic disorders, mental health disorders, cardiovascular disorders, substance use disorders, neurological disorders, chronic pain disorders, sleep disorders and respiratory disorders), distribution channels (B2C (patients) and B2B (healthcare providers, payers, employers and pharmaceutical companies)), purpose of solution (therapeutic or preventive), focus of solution (medication replacement or medication augmentation), type of solution (standalone software applications and software application + device or AI or personal coach) and key regions across the globe (North America (the US and Canada), Europe (Germany, France, Italy, the UK, Russia, and Spain), Asia-Pacific (China, Japan, India, Australia and South Korea) and rest of the world. In order to account for the uncertainties associated with the development of digital therapeutics and novel diagnostic / monitoring solutions and to add robustness to our model, we have provided three forecast scenarios, portraying the conservative, base and optimistic tracks of the market’s evolution. The opinions and insights presented in the report were also influenced by discussions held with senior stakeholders in the industry. The study includes detailed transcripts of discussions held with Adam Kaufman (Canary Health), Amelie Janson (Voluntis), Prayat Shah (Co-founder, Vice President, Partnerships, Wellthy Therapeutics) and Reshma Nayak (Vice President, Marketing and Communications, Wellthy Therapeutics), Stephanie Tilenius (Vida Health) and Vijay Ravindran (Floreo). All actual figures have been sourced and analyzed from publicly available information forums and primary research discussions. Financial figures mentioned in this report are in USD, unless otherwise specified. There are over 100 digital therapeutics that are either commercially available (~27%) or are under development for the treatment of chronic disorders. Close to 30% of these solutions are focused on managing / treating metabolic disorders, such as diabetes. Examples include (in alphabetical order, no selection criteria) Betterise Diabetes (Betterise Health Tech), BlueStar (WellDoc), Diabeo (Voluntis), Lark Diabetes (Lark Health), NewMe Diabetes (Eco-Fusion) and Virta (Virta Health). These are followed by solutions (20%) that target mental health disorders. Other areas for which digital therapeutics are available / under evaluation include cardiovascular disorders, substance use disorders, neurological disorders, sleep disorders, respiratory disorders and chronic pain. In terms of type of digital therapeutics, standalone software applications (share of ~40%) and software applications offered in combination with support of a personal health coach (share of ~14%) have emerged as the most popular types. Other types of digital therapeutics include gaming solutions (share of ~11%), packaged solutions featuring a software application, a device and support of a personal health coach (share of ~10%), and software applications featuring an artificial intelligence based assistant (share of ~7%). Close to 60 digital solutions are also either commercially available or under development for remote digital monitoring and diagnosis of chronic clinical conditions. Of these, 17% are focused on monitoring of cardiovascular conditions, such as cardiac arrhythmias and heart failure. We observed that 13% and 12% of such products are intended for monitoring of patients suffering from metabolic disorders and infectious diseases, respectively. Other areas for which digital monitoring and diagnostic solutions have already been / are being developed include respiratory disorders, mental health conditions, oncological disorders, neurological disorders, ophthalmic disorders and substance use disorders. Around 75% of the companies that are involved in the development of digital health solutions (which include therapeutic, monitoring and diagnostic solutions) for chronic disease management, are small-sized firms / start-ups (less than 50 employees). Examples of start-ups / small-sized companies that have developed / are developing digital therapeutics include (in alphabetical order, no selection criteria) Arthro Therapeutics, Better Therapeutics, BioTrak Therapeutics, Blue Mesa Health, Carrot Health, Dthera Sciences, Floreo, Kaia Health, Lief Therapeutics, Livongo Health, Pear Therapeutics, Vida Health, Virta Health, Vivid Vision and Wellthy Therapeutics. Similarly, examples of start-ups / small sized companies that are developing / have developed digital monitoring and diagnostic solutions include (in alphabetical order, no selection criteria) Athelas, Bioepic, Bodyport, BrainCheck, HealthReveal, iSono Health, Lifespot Health, LindaCare, Pixie Scientific, Rewire, Siren Care, Somatix, Spire and Voluntis. Close to 200 partnerships have been inked between various stakeholders within the industry since 2008; of these, over 50 collaborations were signed in 2017 alone. Marketing & distribution and product integration agreements, with 15% share each, are the most popular partnership models. Examples of recently established deals include collaborations between Bioserenity and Pierre Fabre (May 2018), Big Health and Oxford AHSN (March 2018), Vheda Health and Prestige Health Choice (February 2018), WellDoc and Solera Health (January 2018), Omada Health and Cigna (October 2017), Glooko and Fit4D (April 2017), Voluntis and Sanofi (March 2017), and Qardio and Medelinked (February 2017). Nearly USD 1 billion has been invested in companies operating in digital therapeutics segment over the last 10 years. Interestingly, close to half of the total amount (USD 478 million) was raised in 2017 and 2018, indicating that strategic investors have only recently realized the potential within this domain. Similarly, we identified close to 100 financing instances involving companies working in the monitoring and diagnostics segment of this market. The total amount invested in this sector was observed to be nearly USD 1.8 billion. Khosla Ventures, Social Capital, Merck Global Health Innovation Fund, Draper Fisher Jurveston, General Catalyst, Qualcomm Ventures, Rock Health, Social Capital and Canaan Partners emerged as some of the most active investors in this domain, based on the number of funding instances in which they participated. In order to enhance the adoption of digital solutions in the market for chronic disease management, stakeholders in the industry are exploring innovative marketing strategies. One of the most common models used by companies is selling digital solutions through employer health plans. Other marketing strategies that are being implemented by companies include the use of social media platforms to spread awareness related to digital health solutions to appropriate target patient populations and increasing participation in global events, such as conferences, to gain the required visibility in the market. The market for digital therapeutics is expected to grow at a CAGR of 19.7%% between 2018 and 2030. Similarly, for digital monitoring and diagnostic solutions, we expect the market to grow at an annualized rate of around 13.1% during the same period. Digital health solutions intended for the treatment / management of metabolic, cardiovascular and mental health disorders are expected to occupy majority of the share in the market during the forecast period. North America (primarily the US) and Europe currently capture the largest share (close to 75%) of the overall digital health solutions market. This is followed by Asia-Pacific and rest of the world. As the industry matures, we expect Asia-Pacific to actively drive the growth owing to the sizable user base in the region, at a CAGR of 22.2% for digital therapeutics and 15.5% for digital monitoring & diagnostic solutions. The data presented in this report has been gathered via secondary and primary research. For all our projects, we conduct interviews with experts in the area (academia, industry, medical practice and other associations) to solicit their opinions on emerging trends in the market. This is primarily useful for us to draw out our own opinion on how the market will evolve across different regions and technology segments. Where possible, the available data has been checked for accuracy from multiple sources of information. While the focus has been on forecasting the market over the coming 12 years, the report also provides our independent view on various technological and non-commercial trends emerging in the industry. This opinion is solely based on our knowledge, research and understanding of the relevant market gathered from various secondary and primary sources of information. Chapter 2 provides an executive summary of the insights captured during our research. It offers a high-level view on the likely evolution of the digital therapeutics, monitoring and diagnostic solutions market in the mid to long term. Chapter 3 provides a general overview of the digital health sector, covering details related to the current and future trends affiliated to the domain. The chapter highlights key concepts involved in the development of digital therapeutics. It also features a discussion on strategic initiatives undertaken by several organizations to support the development of digital solutions for treatment of chronic disorders. The chapter also provides an overview of the various product development pathways adopted by the companies in this field. Chapter 4 includes information on over 100 digital therapeutics and close to 60 novel digital monitoring / diagnostic solutions that are currently being evaluated across different stages of development. The chapter features a comprehensive analysis of digital solutions, highlighting the target therapeutic areas, phases of development, type of solution, purpose of solution, and business models adopted for their marketing / sales. In addition, we have presented a comprehensive grid analysis of various digital solutions, highlighting their respective target therapeutic area, type of solution and phases of development. Further, the chapter features a dot-plot analysis of the most active players in the digital therapeutics sector, taking into consideration the status of development of various solutions and company’s current product portfolio specific to digital health. Chapter 5 features detailed profiles of some of the emerging stakeholders that are offering digital therapeutics solutions for patients suffering from various types of chronic disorders. Each profile includes an overview of the company, details related to its digital solutions, clinical trial results, recent developments and a comprehensive future outlook. Chapter 6 includes detailed profiles of some of the emerging stakeholders that are offering digital solutions for monitoring or diagnosis of various types of chronic conditions. Each profile includes an overview of the company, details related to its digital solutions, recent developments and a comprehensive future outlook. Chapter 7 presents a product competitiveness analysis of digital therapeutics on the basis of their respective target therapeutic areas. The analysis allows companies to compare their existing capabilities within and beyond their peer groups and identify opportunities to achieve a competitive edge in the industry. Chapter 8 is a case study on the clinical trials that were / are being conducted for the evaluation of digital therapeutics. The chapter provides an overview of the specific objectives of the aforementioned studies of digital interventions intended for use by patients suffering from chronic disease indications. It features brief information on the study end-points as well. Chapter 9 provides information on the funding instances and investments that have been made in both digital therapeutics and novel digital monitoring / diagnostics space. The chapter includes details on various investments (such as seed financing, venture funding, debt financing and grants) received by companies till May 2018, highlighting the growing interest of the venture capital community and other strategic investors in this domain. Chapter 10 features an elaborate discussion and analysis of the various collaborations and partnerships that have been inked amongst players in this market. We have also discussed the different partnership models (including pilot product offerings, product integration agreements, marketing and distribution agreements, product development agreements, product evaluation agreements, research and development agreements, acquisition agreements, product launch agreements, technology licensing agreements, product licensing agreements, clinical trial agreements and others ) and the most common forms of deals / agreements that have been established in the period between 2011 and 2018, in this field. Chapter 11 features a detailed case study highlighting the go-to-market strategies adopted by companies engaged in this space. It presents insightful information on important marketing strategies, such as inbound marketing through social media platforms, promotional activities through official websites, business models and pricing models used by various players in the market. Chapter 12 presents a comprehensive market forecast, highlighting the future potential of the market till 2030 based on multiple parameters, such as prices of digital solutions, indication / region specific adoption trends, distribution channels and competitive landscape. We have provided an informed estimate on the likely evolution of digital therapeutics and digital monitoring / diagnostic solutions. In addition, we have segmented the market by therapeutic areas (such as metabolic disorders, mental health disorders, cardiovascular disorders, substance use disorders, neurological disorders, chronic pain disorders, sleep disorders and respiratory disorders), distribution channels (B2C (patients) and B2B (healthcare providers, payers, employers and pharmaceutical companies)), purpose of solution (therapeutic or preventive), focus of solution (medication replacement or medication augmentation), type of solution (standalone software applications and software application + device or AI or personal coach) and key regions across the globe (North America (the US and Canada), Europe (Germany, France, Italy, the UK, Russia, and Spain), Asia-Pacific (China, Japan, India, Australia and South Korea) and rest of the world. Chapter 13 presents a detailed discussion on the future opportunities of digital solutions for chronic disease management. It also highlights the key parameters and trends that are likely to influence the future of this market, under a comprehensive SWOT framework. Chapter 14 is a collection of interview transcripts of the discussions that were held with key stakeholders in this market. The chapter provides details of interviews held with Adam Kaufman (Canary Health), Amelie Janson (Voluntis), Prayat Shah (Co-founder, Vice President, Partnerships, Wellthy Therapeutics) and Reshma Nayak (Vice President, Marketing and Communications, Wellthy Therapeutics), Stephanie Tilenius (Vida Health) and Vijay Ravindran (Floreo). Chapter 16 is an appendix, which provides the list of companies and organizations mentioned in the report.